Respiratory virus infection results in considerable pulmonary immunopathology, a component of which results from the host immune responses. We have developed a murine model to specifically examine the lung injury due to CD8+ T cell recognition of an influenza hemagglutinin (HA) transgene on lung epithelium in the absence of replicating virus, after adoptive transfer. Lung injury is largely mediated by chemokines expressed by the epithelial cells upon T cell recognition mediated by TNF-α. To determine the critical source of TNF-α, HA-specific TNF−/− CD8+ T cells were transferred into HA transgenic animals, and lung injury was not observed, though these T cells exhibited no defect in antiviral activity in vivo. This indicates that the initiating event in the injury process is Ag-specific expression of TNF-α by antiviral CD8+ T cells upon recognition of alveolar epithelial Ag, and that the effector activities responsible for viral clearance may be dissociable from those resulting in immunopathology. Significant lung injury frequently accompanies clinical and experimental respiratory virus infection, which may be mediated both by the direct effects of the virus as well as the host immune response. Influenza-infected T cell-deficient mice survive longer and demonstrate a lesser degree of pulmonary immunopathology than WT mice (1). CD8+ T cell effector activities may contribute to the immunopathology associated with influenza, and possibly with other infections, such as respiratory syncytial virus (RSV)4 and severe acute respiratory syndrome (2, 3). Autopsies from the 1918 influenza pandemic revealed histology that, although not specific, was consistent with immunopathologic lung injury in a number of cases (4). Furthermore, biopsies from interpandemic influenza pneumonia often reveal acute lung injury with organizing pneumonia, which is likely immunopathologic in nature (3). Similarly, the clinical course of severe acute respiratory syndrome appears to have three phases, the second characterized by an apparent immune-mediated lung injury, which may respond to corticosteroid therapy (2). CD8+ T cell function is important in the clearance of respiratory virus infection and these cells use a variety of effector mechanisms in this function, including the perforin/granzyme system (5), Fas/Fas ligand (6), and IFN-γ (7). There is little evidence that perforin or Fas ligand directly mediate immunopathology, though perforin may participate in immunoregulatory events that protect against tissue injury (8, 9). Adoptive transfer of CD8+ effector T lymphocytes is protective against lethal influenza infection in mice (10, 11, 12), and this effect appears to require either perforin- or Fas-mediated cytolytic activity (6). Clinical illness in murine RSV and influenza may be reduced by systemic neutralization of TNF-α, without an impairment of viral clearance (13), though the mechanisms are unclear and the data are conflicting (7). And while IFN-γ may enhance immunopathology in experimental RSV infection (7), it may actually mitigate CD8+ T cell-mediated lung injury in influenza (14). In dissecting the specific contribution of individual T cell effector activities, it becomes difficult to separate their impact on viral replication and viral cytopathic effects from true immunopathologic effects. To understand mechanisms of CD8+ T cell-mediated tissue injury in the absence of virus replication, we used a murine model in which the A/Japan/57 influenza hemagglutinin (HA) is selectively expressed in pulmonary type II alveolar cells and lung injury is induced by the adoptive transfer of HA-specific CD8+ CTL (15). Prior studies in this model have demonstrated that the initial encounter of effector CD8+ T cells with Ag results in minimal clinical, histologic, and physiologic impairment. Furthermore, the transferred T cells undergo several rounds of proliferation before they exit the lung parenchyma (16). This occurs in the first 2 days after transfer, at a time when the injury is minimal and there is no detectable alveolar cell cytotoxicity. By 4–5 days after transfer, the lungs become infiltrated with host macrophages and lymphocytes and it is this infiltration that correlates with clinical illness, physiologic and histologic injury (diffuse alveolar damage), and death. Although IFN-γ expression parallels the presence of intraparenchymal Ag-specific T cells (i.e., ∼2 days), the expression of TNF-α is detectable for several days after, suggesting macrophage expression (16). Interestingly, neutralization of TNF-α coincident with T cell transfer ablated the lung injury (17), though the precise mechanism was unclear. Alveolar epithelial cells in vitro express a variety of chemokines upon T cell recognition and neutralization of one critical chemokine, MCP-1, dramatically reduced infiltration and injury after T cell transfer (18). Therefore, we sought to specifically determine the role of Ag-dependent CD8+ T cell-derived TNF-α on lung injury triggered by alveolar Ag recognition, in the absence of injury due to replicating virus. In this study, we show that Ag-specific TNF-α expression by CD8+ T cells is an important mediator of pulmonary immunopathology, and is not required for clearance of influenza by activated CD8+ T cells. HA transgenic mice (H-2d) expressing the A/Japan/57 influenza HA in the lung were previously described (15), and were backcrossed into the BALB/c and B10.D2 background (5–6 crosses) for controls where indicated. p55−/− mice (H-2b; The Jackson Laboratory, Bar Harbor, ME) were bred (4 crosses) with B10.D2 (C57BL/6-H-2d congenics). TNF−/− mice (H-2b) were provided by Dr. G. Kollias (Hellenic Pasteur Institute, Athens, Greece) and also bred with B10.D2, as above. Actin-Kd transgenic mice were produced by subcloning the class I MHC molecule, Kd (15), into pUC18 with the murine β-actin promoter (17), and microinjecting into C57BL/6 blastocysts. CD8+ T cell lines and clones specific for Kd-restricted epitopes of A/Japan/57 HA were previously described (18). They were stained for H-2Kd using mAb SF1.1 (American Type Culture Collection, Manassas, VA), and tested for Ag specificity using ELISA for IFN-γ (BD Biosciences, La Jolla, CA) and cytotoxicity with chromium release assays (15). HA transgenic mice were used at 12–16 wk of age (18–24 grams; b/d F1 recipients were used where indicated). CD8+ T cells were purified and injected via the tail vein into appropriate recipients. Lungs were harvested at appropriate times for histology and homogenized in protease inhibitors for ELISA (MCP-1 and IFN-γ; BD Biosciences). Adoptive protection experiments were performed by infecting animals intranasally with 10 LD50 A/Japan/57 (19), followed by transfer of T cells. CD8+ T cells were labeled with CFSE (Molecular Probes, Eugene, OR), and enumeration of transferred T cells was accomplished by FACS analysis as described (16). Six hours after T cell transfer, recipient animals were anesthetized, exsanguinated, and their lungs were perfused via the pulmonary artery. Isolation of primary alveolar type II cells was performed as described (17). Briefly, Dispase (Collaborative Research, Bedford, MA) with 0.1 mM actinomycin D (Sigma-Aldrich, St. Louis, MO) was instilled via the trachea, followed by 1% low melt agarose. After disruption of the lungs, cell suspensions were negatively selected with anti-CD45 and anti-CD32 (BD Biosciences), resulting in a type II cell purity of between 90 and 95% (17). RNA was extracted and hybridized to chemokine miniarrays (Superarray, Frederick, MD). Signals were quantitated, normalized to expression of GADPH, and expressed as a ratio of wild type (WT) to p55−/− (HA+). Significant differences were determined by Student’s unpaired t test or the Mann-Whitney U test. We previously showed that lung injury after CD8+ T cell transfer was ablated by TNF-α neutralization in vivo, and that chemokine expression by alveolar epithelial target cells is critical to host cell infiltration and injury, in the absence of direct cytotoxicity (17). It is likely that the p55 TNFR mediates this effect, because it is required for NF-κB activation in most cells (20), and MCP-1 expression is dependent upon NF-κB activation (21). To confirm this, we transferred WT CD8+ T cells into WT and p55−/− animals (all HA+ unless otherwise noted), and harvested their lungs to isolate type II alveolar epithelial cells. As shown in Fig. 1⇓A, type II alveolar cells isolated from WT recipients 6 h after transfer of CD8+ T cells expressed considerably higher levels of several chemokine mRNAs than were expressed by p55−/− alveolar cells. Furthermore, ELISA on whole lung extracts confirmed that MCP-1 was induced to a significant degree in WT vs p55−/− recipients (Fig. 1⇓B). The alveolar epithelial source of MCP-1 was confirmed morphologically by in situ hybridization (data not shown), localizing to the junctions of alveolar septa, as previously described (18). The CD8+ T cells localize to this site as well (15), but do not express MCP-1 (18). Because we have shown that at least one of the chemokines (MCP-1) expressed by the target epithelial cells in a p55-dependent fashion is an important mediator of the immunopathology resulting from CD8+ T cell recognition of alveolar Ag, we transferred WT CD8+ T cells into p55−/− vs WT recipients to assess the clinical and histologic outcomes. As shown in Fig. 2⇓A, deficiency of the p55 receptor is protective against clinical illness (weight loss) induced by CD8+ T cell transfer. Furthermore, the p55−/− recipients were completely protected against lethal injury that is normally observed after CD8+ T cell transfer, compared with WT recipients, which were all dead by day 8 (Fig. 2⇓B). Histologically, lungs of p55−/− recipient animals were only slightly abnormal at day 5 after transfer (Fig. 3⇓A). In contrast, sections from WT recipients at day 5 demonstrate massively infiltrated interstitial and alveolar spaces, with mononuclear cell infiltrates, and diffuse alveolar damage (Fig. 3⇓B). The mild residual inflammation in the p55−/− recipient lungs suggests that there may be a p55-independent component to the injury, possibly involving the p75 TNFR, though this is clearly minor. p55 mediates alveolar epithelial cell chemokine expression. A, RNA expression profiles of type II alveolar cells harvested from HA+ recipients, either p55−/− or WT (B10.D2 background), 6 h after transfer of WT CD8+ T cells. Signals were normalized to GADPH, and expressed as a ratio of WT to p55−/− cells (representative of three experiments). B, ELISA for MCP-1 in whole lung extract 24 h after transfer of WT CD8+ T cells into p55−/− or WT recipients. p55 mediates clinical injury resulting from CD8+ T cell transfer. A, Weight loss after transfer of CD8+ T cells into p55−/− (▴) or WT (▪) recipients. Shown are means of three experiments with six mice per group. B, Survival after transfer of CD8+ T cells into p55−/− or WT recipients. The data represent two experiments, each with 10 mice per group. H&E-stained sections of lungs harvested 5 days after transfer of WT CD8+ T cells into p55−/− (A) or WT (B) recipients, at ×10 and ×40 magnification (insets). Although there are many examples of inflammatory amplification mediated by TNF-α, in an Ag-nonspecific fashion (13, 22), we sought to isolate the specific contribution of Ag-dependent TNF expression by the CD8+ T cells to the observed tissue injury. As such, we developed Kd-restricted TNF-deficient CD8+ T cells, specific for the 210–219 epitope of A/Japan/57 HA, for transfer into WT HA+ mice. Because the haplotype of the TNF−/− mouse is H-2b, and there are no Kb- or Db-restricted epitopes in A/Japan/57 HA, and because the proximityof the MHC locus to the TNF locus makes recombination unlikely, we generated transgenic mice expressing Kd under the control of the actin promoter to obtain Kd-restricted TNF−/− T cells. Several founder lines were screened and a variety of cells and tissues were analyzed for Kd expression. We used a line in which Kd expression on CD8+ T cells was similar to the level of Kd on T cell clones derived from BALB/c mice (Fig. 4⇓A). Actin-Kd transgenic animals were then bred with TNF−/− animals and immunized to generate CD8+ T cell lines and clones. These T cells exhibited comparable effector activity to CD8+ T cells derived from WT actin-Kd littermates (as well as native BALB/c-derived CD8+ clones), such as peptide-specific IFN-γ secretion and in vitro cytotoxic activity (data not shown). Most importantly, the ability to clear an otherwise lethal influenza pneumonia from intranasally infected BALB/c mice was identical to CD8+ T cells derived from either WT (Kd transgenic) littermates (Fig. 4⇓B), or from WT BALB/c (data not shown), and provided 100% protection against lethal infection. We also confirmed that the trafficking of the TNF−/− actin-Kd T cells through the lungs was identical with both WT (BALB/c) T cells and (WT) actin-Kd littermates of TNF−/− mice by enumerating intraparenchymal CFSE-labeled T cells at several time points after adoptive transfer, and found no differences between any of the T cells (data not shown). Influx of activated CD8+ T cells into the lung parenchyma after tail vein injection was observable within hours of transfer, with limited intraparenchymal proliferation, and efflux occurring over 24–48 h with all of the T cells, as we have previously described (16). This pattern was similar whether the HA+ recipients were H-2d/d or H-2d/b F1 (data not shown). To assess the contribution of Ag-specific TNF-α expression to CD8+ T cell-mediated lung injury, adoptive transfer was performed with TNF−/− CD8+ T cell lines, compared with lines derived from WT Kd-transgenic animals, into WT (HA+) recipients. As shown in Fig. 5⇓A, lungs from recipients of TNF−/− T cells have very little residual infiltration and injury, compared with recipients of WT T cells (Fig. 5⇓B). The pattern was identical in H-2d/d or H-2d/b F1 (HA+) recipients (data not shown). These animals were also completely protected from clinical illness as well as lethality (data not shown), despite the WT TNF status of the recipient. Adoptive transfer of several WT and TNF−/− CD8+ clones produced similar results. It is unclear the degree to which the TNF status of the recipient is important in this process, because in the absence of TNF-α expressed by the T cell, minimal macrophage infiltration is evident (the likely additional source of TNF-α). Because TNF-α expression in the lung that occurs after WT T cell transfer persists longer than do the T cells, it is likely that there is a contribution of host TNF-α in the amplification of the injury, though clearly the initiation requires TNF-α expression by the CD8+ T cell upon Ag recognition. Kd expression and in vivo function of TNF−/− actin-Kd CD8+ T cells. A, FACS analysis of Kd expression on CD8+ T cell clones derived from BALB/c (thick line), C57BL/6 (thin line), and actin-Kd transgenic mice (dotted line). B, Survival after transfer of TNF−/− Kd-restricted HA210-specific CD8+T cells simultaneous with intranasal infection of BALB/c mice with 10 LD50 of A/Japan/57 (□) compared with infection alone (♦). A rate of 100% survival was also observed after coadministration of WT littermate-derived (actin-Kd+) CD8+ clones or WT BALB/c-derived CD8+ clones (data not shown). Data are representative of three experiments, each with 10 mice per group. TNF−/− CD8+ T cells produce minimal lung injury after transfer. 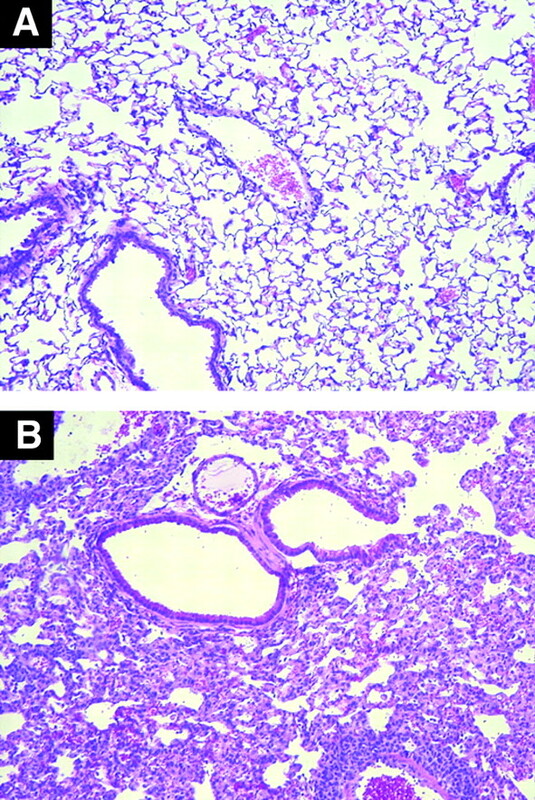 H&E-stained sections of lungs from WT (HA+) mice 5 days after transfer of 5 × 106 TNF−/− T cells (A), compared with 5 × 106 CD8+ T cells (B) derived from TNF+/− actin-Kd+ littermate. Data are representative of three experiments. The patterns were identical whether the HA+ recipients were H-2d/d or H-2d/b F1 (data not shown). Because in vivo neutralization of MCP-1 significantly abrogates inflammation and injury after CD8+ T cell transfer, MCP-1 expression was examined by ELISA of whole lung homogenates after T cell transfer. Transfer of WT but not TNF−/− T cells resulted in significant MCP-1 production by 24 h, and it was dependent upon Ag (HA) recognition (Fig. 6⇓A). Whole lung IFN-γ expression was also Ag-dependent (essentially undetectable in HA− recipients), but not significantly different between recipients of TNF−/− vs WT CD8+ T cells (Fig. 6⇓B). Similarly, transfer of an irrelevant CD8+ T cell clone (specific for influenza nucleoprotein) into HA+ mice resulted in no immunopathology (15, 23), and only background levels of IFN-γ and TNF-α (data not shown). Because CD8+ T cell production of IFN-γ is dependent upon Ag engagement (24), these data indicate that both T cell populations were equally capable of trafficking to the alveolar parenchyma and interacting with Ag presented by the alveolar epithelial cell, but that in the absence of TNF-α expression, T cell Ag recognition did not result in epithelial activation. A, ELISA for MCP-1 in whole lung extracts harvested from WT HA+ or HA− littermate recipients 24 h after transfer of 5 × 106 TNF−/− vs WT CD8+ T cells (from actin-Kd+ littermate; p < 0.01). B, ELISA for IFN-γ in lung extracts 24 h after transfer of 5 × 106 TNF−/− T cells into WT HA+ (▪) or HA− (▦) compared with 5 × 106 WT CD8+ T cells (from actin-Kd+ littermate; p = 0.37 between WT and TNF−/−). Data are representative of two experiments. TNF-α is expressed on CD8+ T cells primarily as a transmembrane protein (25), though a soluble cleavage product is also produced (26). Transmembrane TNF-α preferentially activates alveolar epithelial MCP-1 expression compared with soluble TNF-α (18), and it is possible that this is a result of differential TNFR use (27). In fact, both TNFRs may be required for optimum induction of alveolar cell chemokine expression by TNF-α (M.Q.Z. and R.I.E, unpublished observations). In summary, we have demonstrated that TNF-α expressed by effector CD8+ T cells in response to Ag recognition triggers significant lung injury in the absence of virus infection, and that this is mediated by p55. Furthermore, TNF-α is not required for CD8+ T cell antiviral effector activity in the lung. This raises the intriguing possibility that it may be possible to mitigate the lung injury in respiratory virus infection without crippling antiviral effector function, which may have important clinical implications. ↵1 This work was supported by Public Health Service Grants HL58660 and HL70816. ↵2 L.X., H.Y., and M.Q.Z. contributed equally to this work. ↵4 Abbreviations used in this paper: RSV, respiratory syncytial virus; HA, hemagglutinin; WT, wild type. Wells, M. A., P. Albrecht, F. A. Ennis. 1981. Recovery from a viral respiratory infection. I. Influenza pneumonia in normal and T-deficient mice. J. Immunol. 126:1036. Rainer, T. H., P. K. Chan, M. Ip, N. Lee, D. S. Hui, D. Smit, A. Wu, A. T. Ahuja, J. S. Tam, J. J. Sung, P. Cameron. 2004. The spectrum of SARS-associated coronavirus infection. Ann. Intern. Med. 140:614. Yeldandi, A. V., T. V. Colby. 1994. 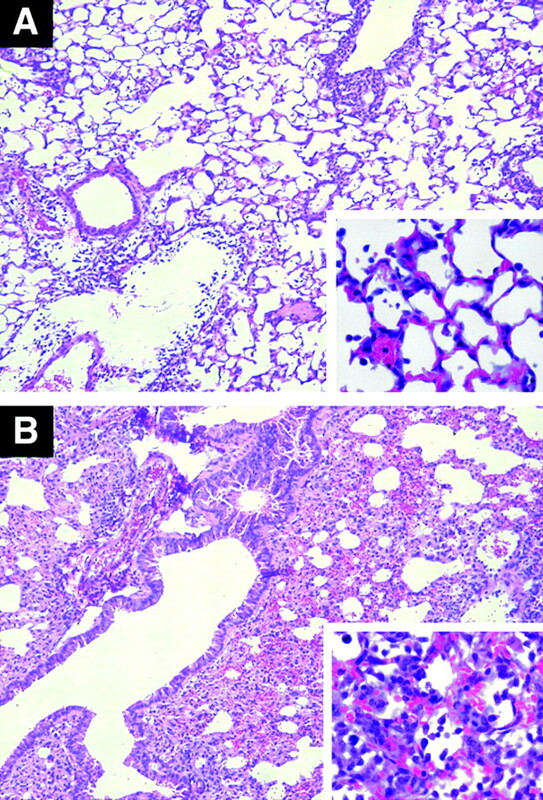 Pathologic features of lung biopsy specimens from influenza pneumonia cases. Hum. Pathol. 25:47. Taubenberger, J. K., A. H. Reid, T. G. Fanning. 2000. The 1918 influenza virus: a killer comes into view. Virology 274:241. Clark, W. R.. 1994. Immunology: the hole truth about perforin. Nature 369:16. Topham, D. J., R. A. Tripp, P. C. Doherty. 1997. CD8+ T cells clear influenza virus by perforin or Fas-dependent processes. J. Immunol. 159:5197. Ostler, T., W. Davidson, S. Ehl. 2002. Virus clearance and immunopathology by CD8+ T cells during infection with RSV are mediated by IFN-γ. Eur. J. Immunol. 32:2117. Aung, S., J. Rutigliano, B. Graham. 2001. Alternative mechanisms of respiratory syncytial virus clearance in perforin knockout mice lead to enhanced disease. J. Virol. 75:9918. Badovinac, V., S. Hamilton, J. Harty. 2003. Viral infection results in massive CD8+ T cell expansion and mortality in vaccinated perforin-deficient mice. Immunity 18:463. Lukacher, A. E., V. L. Braciale, T. J. Braciale. 1984. In vivo effector function of influenza virus-specific CTL clones is highly specific. J. Exp. Med. 160:814. Yap, K. L., G. L. Ada, I. F. McKenzie. 1978. Transfer of specific cytotoxic T lymphocytes protects mice inoculated with influenza virus. Nature 273:238. Wells, M. A., F. A. Ennis, P. Albrecht. 1981. Recovery from a viral respiratory infection. II. Passive transfer of immune spleen cells to mice with influenza pneumonia. J. Immunol. 126:1042. Hussell, T., A. Pennycook, P. J. Openshaw. 2001. Inhibition of TNF reduces the severity of virus-specific lung immunopathology. Eur. J. Immunol. 31:2566. Wiley, J. A., A. Cerwenka, J. R. Harkema, R. W. Dutton, A. G. Harmsen. 2001. Production of IFN-γ by influenza hemagglutinin-specific CD8+ effector T cells influences the development of pulmonary immunopathology. Am. J. Pathol. 158:119. Enelow, R. I., A. Z. Mohammed, M. H. Stoler, J. S. Young, Y. H. Lou, T. J. Braciale. 1998. Experimental T cell-mediated lung disease: structural and functional consequences of alveolar cell recognition by CD8+ T lymphocytes. J. Clin. Invest. 102:1652. Small, B. A., S. A. Dressel, C. W. Lawrence, D. R. Drake, M. H. Stoler, R. I. Enelow, T. J. Braciale. 2001. CD8+ T cell-mediated injury in vivo progresses in the absence of effector T cells. J. Exp. Med. 194:1835. Liu, A. N., A. Z. Mohammed, W. R. Rice, D. T. Fiedeldey, J. S. Liebermann, J. A. Whitsett, T. J. Braciale, R. I. Enelow. 1999. Perforin-independent CD8+ T-cell-mediated cytotoxicity of alveolar epithelial cells is preferentially mediated by TNF-α: relative insensitivity to Fas ligand. Am. J. Respir. Cell Mol. Biol. 20:849. Zhao, M. Q., M. H. Stoler, A. N. Liu, B. Wei, C. Soguero, Y. S. Hahn, R. I. Enelow. 2000. Alveolar epithelial cell chemokine expression triggered by antigen-specific cytolytic CD8+ T cell recognition. J. Clin. Invest. 106:R49. Graham, M. B., V. L. Braciale, T. J. Braciale. 1994. Influenza virus-specific CD4+ T helper type 2 T lymphocytes do not promote recovery from experimental virus infection. J. Exp. Med. 180:1273. Baud, V., M. Karin. 2001. Signal transduction by TNF and its relatives. Trends Cell Biol. 11:372. Ping, D., G. H. Boekhoudt, E. M. Rogers, J. M. Boss. 1999. Nuclear factor-κB p65 mediates the assembly and activation of the TNF-responsive element of the murine monocyte chemoattractant-1 gene. J. Immunol. 162:727. Kagi, D., A. Ho, B. Odermatt, A. Zakarian, P. S. Ohashi, T. W. Mak. 1999. TNF receptor 1-dependent β cell toxicity as an effector pathway in autoimmune diabetes. J. Immunol. 162:4598. Enelow, R. I., M. H. Stoler, A. Srikiatkhachorn, C. Kerlakian, S. Agersborg, J. A. Whitsett, T. J. Braciale. 1996. A lung-specific neo-antigen elicits specific CD8+ T cell tolerance with preserved CD4+ T cell reactivity: implications for immune-mediated lung disease. J. Clin. Invest. 98:914. Slifka, M. K., F. Rodriguez, J. L. Whitton. 1999. Rapid on/off cycling of cytokine production by virus-specific CD8+ T cells. Nature 401:76. Kinkhabwala, M., P. Sehajpal, E. Skolnik, D. Smith, V. K. Sharma, H. Vlassara, A. Cerami, M. Suthanthiran. 1990. A novel addition to the T cell repertory: cell surface expression of TNF/cachectin by activated normal human T cells. J. Exp. Med. 171:941. Crowe, P. D., B. N. Walter, K. M. Mohler, C. Otten-Evans, R. A. Black, C. F. Ware. 1995. A metalloprotease inhibitor blocks shedding of the 80-kD TNF receptor and TNF processing in T lymphocytes. J. Exp. Med. 181:1205. Grell, M., E. Douni, H. Wajant, M. Lohden, M. Clauss, B. Maxeiner, S. Georgopoulos, W. Lesslauer, G. Kollias, K. Pfizenmaier, et al 1995. The transmembrane form of TNF is the prime activating ligand of the 80 kDa TNF receptor. Cell 83:793.